When placing an order online, you may pay via credit card (Visa, Mastercard, American Express, Discover) or Paypal. Please contact customer service by completing and submitting our contact form. 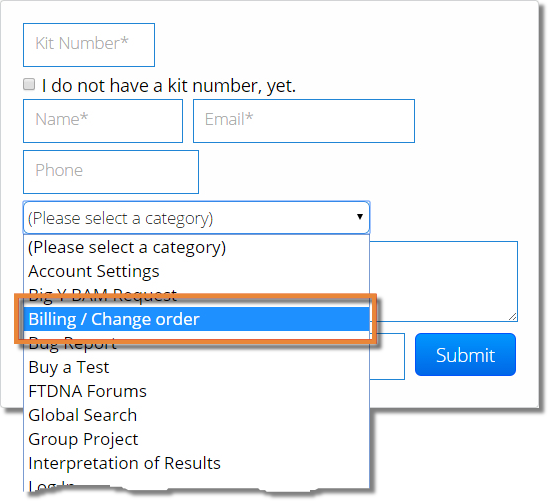 Make sure to select Billing / Change order on the drop-down list. Note that we will process tests only after we receive payment in full. *You do not have to order through a group project, although most Y-DNA tests get a discount if you do. Is it possible to pay for a kit and send it to another person (third party billing)? Yes. We accept third party billing. When you place an order, you may choose a billing address that is different from the shipping address. Yes, you may pay for an upgrade on someone else’s kit. The kit owner must first agree and submit their permission in writing to Customer Support through the primary email address on the kit. Customer Support will need to place the order and can assist you with billing. You may contact customer service by completing and submitting our contact form. 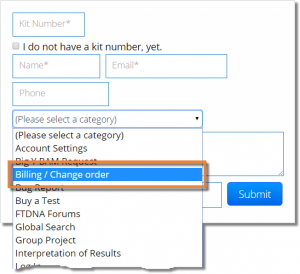 Make sure to select Billing / Change order on the drop-down list. The individual may change their mind and have your access to their account blocked. They will need to repay all other parties for any testing before we are able to facilitate their request. Yes, we can help you change your order before your test is batched to the lab. Batches usually close on Wednesday, but that is subject to change based on staffing and volume. Once a test has gone to the lab, however, we are not able to change the test nor are we able to refund. Generally, once a test has gone to the lab, we are not able to refund. All refunds are at the discretion of customer support. Please allow 3 – 5 business days for any refund to be processed.